Ten Tiny Plays written by, about and for the people living in and around Brockley inspired by their vision of the best that Brockley can be. Well that was the idea – so imagine our delight when we were able to present not ten but 17 tiny plays from all corners of Brockley, covering all kinds of subjects – from here to the future. On 3rd June, Just Jones & RT Productions presented 17 tiny plays at the Jam Circus in Brockley. 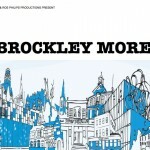 All the tiny plays (from 3 line to 3 minutes with 3 actors or fewer) were inspired by the theme of Brockley More – the biggest and brightest visions for the greater SE4 area. Part of Brockley Max Festival.